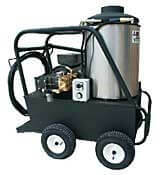 This state-of-the-art electric high-pressure washer is distinguished by variable operating pressure; rust free burner fuel tank, 40' pressure hose, as well as precise chemical injection. Thermal-relief valve is installed to prevent overheating of the pump. 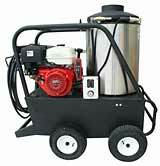 Diesel fired washer is fully portable, no electricity required , equipped with 12 volt oil fired burner. The greatest innovation presents an oil - fired burner that uses diesel fuel to achieve a 140°F rise in water temperature. Also, look for optional accessories like the swivel hose reel that mounts to the frame. Please remember all hot water machines must be properly vented if operated indoors. Electric powered engines run on 120V and 230V. Briggs Intek, Honda and Vanguard are gasoline powered engines. Hatz Diesel is diesel powered engine.